Riding and being around horses can offer your child much more than equestrian know-how. Many parents who have brought their children up around horses will tell you that they don’t know of a better way to raise kids. Riding teaches them to think on their feet; learn respect; and accept responsibility for their actions. Riding families have always known that horses are good for kids, but now research is backing up their assertions: studies have shown a significant positive correlation between horsemanship skills and life skills. If your child likes animals, maybe it’s time to get them involved with horses and give them the chance to blossom. Allow your child to build a bond with a horse, and then hand the reins of responsibility over to them. Keep an eye on them both, but make sure that it is your child doing all of the work of caring for the horse, from feeding to grooming to mucking out. Many children will try to wriggle out of their responsibilities and only do the fun parts, like riding their horse and playing with it. If they don’t get away with leaving the hard parts to you, they’ll get far more out of horse ownership. Once they understand that the horse cannot survive without them, and that they cannot ride without first caring for it, they’ll begin to appreciate that hard work pays off. There is nothing more rewarding for a child than seeing a happy, healthy pony come running across the field to greet them. Horses will not work with someone unless they trust them completely. Your child must put the time into bonding with their horse and developing a trusting relationship before they can work together. They’ll learn the values of patience and commitment in building a trusting partnership, and see the worth of such attributes when they start bringing home the ribbons. There is a unique empowerment which comes from controlling a ton of muscle and pure power with just two thin strips of leather. If your child can sit at such a great height without fear, they’ll feel indomitable. That will carry over into other areas of their life, lending them a quiet confidence and an absolute immunity to intimidation. Horses won’t play ball right away. They won’t simply do as your child asks them to do. It will take time and perseverance to build a solid partnership. The patience they learn will serve them well in every area of their life. Horses are hard to care for. They require an almost encyclopedic knowledge, the interest to invest time in constantly researching and reviewing whether they’re doing things right and hours of their day spent at the stables. Even the most experienced horseman will turn to equine nutritionists, behaviorists and medical professionals when things go wrong; they’ll have to learn to accept that they don’t know everything and that others might know more. If your child can get up early to care for their horse before school, give them their dinner in an evening before they have their own, learn to recognize their shortcomings and ask for help, and instill in themselves the discipline to work their life around their passion, then this will serve them well academically and professionally as they grow older. Horse riders have to learn to be empathetic and compassionate; it’s nigh on impossible to bully an animal weighing over a ton into doing what you want them to. They will learn to be calm and sensitive to the needs of their partner. Your child will soon grasp that if their horse is misbehaving, they have to pay attention and find the root cause of the problem – fear or anger or pain – rather than shouting them into submission. Such qualities are likely to be looked on favorably in their professional careers as they grow older. 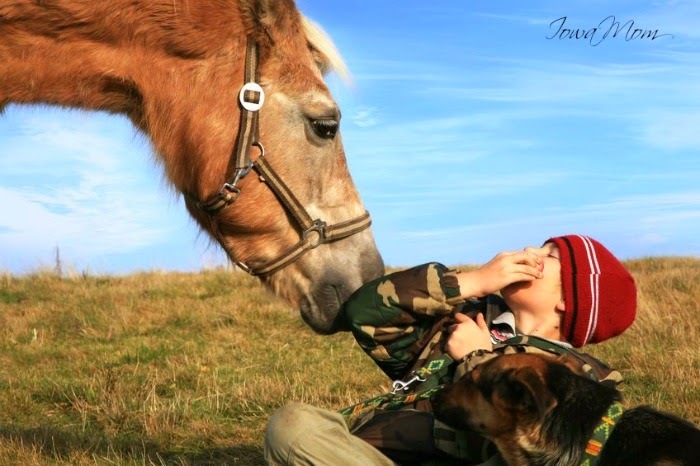 Above all, if your child loves horses, then they will love being around them. Some of the best moments in their life will be spent in the saddle. They’ll make friends from all backgrounds, of all ages, all united by their common passion. They’ll feel the wind in their hair and the sunshine on their backs, and they’ll laugh as they gallop at such speed that their eyes stream and the sound of the wind deafens them. Who wouldn’t want that for their child? I have always loved horses and horseback riding. When I first saw one, I was a bit overwhelmed by the size. Your article is very informative. I agree with this post. Horses are a great way to teach children. They truly are amazing animals. I never had the chance to grow up around them, but all of my friends who did definitely had a lot more respect and sensibility than most. What a great post. I'm sure even I can learn from them also. What a wonderful post. I'm sure even I, as an adult can learn from them also. I love horses. My granddaughter rides. I would like the other grandkids to also ride but unfortunately it is not in the budget right now. Horses are such awesome animals! What a great post! Horses are beautiful creatures. Wonderful post!